Rest in Dragobrat at mini-hotel «Velyka Vedmedytsia». Comfortable double and triple rooms. WI-FI, Internet, parking, half-board, sauna, transfer to the hotel, from 150 m to a ski lift. Min-hotel "Velyka Vedmedytsia" is located in Dragobrat ski resort at the foot of Stig Mountain; it is 150 m from the lift. This hotel has a direct path to the ski slopes. The hotel operates in winter (like a ski resort) and in summer (excursions, mushrooms' and berries gathering, climbing tours and so on). 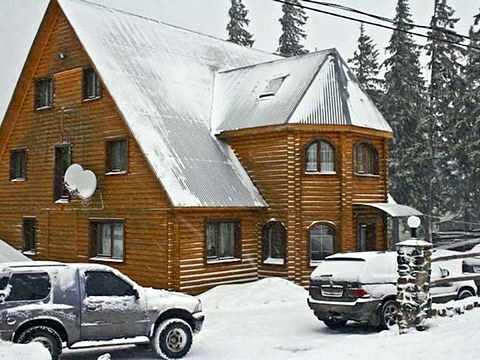 "Velyka Vedmedytsia" hotel is a three-storey wooden building with two- and three-bed comfortable rooms. Rooms of the hotel are decorated in the traditional style. Each room has all necessary furniture, TV set with cable TV, a bathroom with a shower, Wi-Fi Internet access. Guests of the hotel can use the grill for making barbecue, rest in the sauna on the territory of this hotel. It is also possible prepare food at the well-equipped kitchen. There is a bar, a sauna and rental of equipment on the territory of the hotel as well. The administration at the guests' request can make a transfer to the hotel. This hotel has everything you need for active rest both in winter and summer. 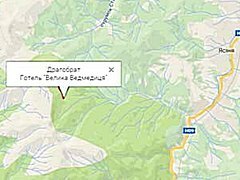 In summer walking tours are organized towards the glacier lakes, to the source of Tysa River, climbing tours to Hoverla and Petros Mountains. The rooms of the hotel have all necessary furniture and appliances for comfortable stay of guests. Rooms of this class include attic rooms, rooms with a bathroom and a toilet on the floor. There are spacious and comfortable rooms for three people. Rooms have large windows, so all day the rooms are light, clean and cozy. Rooms of this class include rooms with a bathroom and a toilet on the floor. Two meals a day are included. There is a possibility to prepare food at a well-equipped kitchen as well. Price per accommodation at "Velyka Vedmedytsia" hotel is stipulated in UAH per night with two meals a day. It is made a prepaid reservation at the rate of 30% of your booking. Free booking cancellation 14 days before the arrival, in holidays – 21 days before the arrival. In case of late cancellation or non-arrival prepayment is not refundable. • excursion programs: glacier lakes, Hoverla and Petros Mountains, the source of Tysa River. you have to go to Ivano-Frankivsk, then you have to take a regular bus from the railway station or the bus station towards Yaremche. From Yaremche you will take a regular bus or a taxi to Yasinia settlement. After that you have to book a special transfer to the hotel at the reservation department on the telephone number +38 (067) 448-84-48. You can also to book a transfer from Ivano-Frankivsk to the hotel and back on the same telephone number. you have to choose the road Chop-Kyiv М-06 to Mukachevo city. Then you drive in a southeasterly direction to the road Mukachevo - Ivano-Frankivsk - Lviv Н-09. You drive it less than 200 km to Yasinia settlement. Then you have to book a special transfer from Yasinia to the hotel. Note. You can get to the hotels of Dragobrat if you have a four-wheel drive vehicle with a powerful engine and if you can manage with mountains roads of high complexity.